I first heard about Riga from friends who had been for a stag weekend there; like Prague and other ex-Soviet Bloc cities, it is well established on the lad’s stag circuit. Unlike my friends, I decided to go for a romantic weekend with my girlfriend and, also rather differently, we went in February when the temperature routinely plummets to -25°C. An act of madness? – let’s find out! Riga is the capital of Latvia, a country I had never heard of, which lies on the other side of the Baltic from Sweden. Until 1991, it was part of Soviet Russia but it doesn’t feel like a Russian city, although you sometimes sense a world of gangsters and black marketers lurking beneath the surface. In fact, some of the bars are run by gangs and exist solely to fleece unwary male tourists – a pretty girl will get chatting to you and ask you to buy her a drink; when the bill arrives it will be for several hundred pounds. It happened to a friend of mine so beware! The main tourist area is centred around the old town which is incredibly pretty and looks like something from the lid of a chocolate box. If you are into your architecture, it is apparently the best example of art deco architecture in Europe. There is a nice mixture of museums, bars and restaurants in the old town and it’s a lovely place to have a wander around. All of Northern Europe had been experiencing a seriously cold winter when we went and it was so cold in Riga that people were skating on the river. We knew what to expect though and had brought ski clothes along and it was actually good fun wandering around in the snow. Latvia has its own currency, the Lati, and one of them is worth about £1.20. Everything in the old town costs twice as much as anywhere else in the city but, even so, a beer is still a very reasonable £2.40. We stayed in a small independent hotel in a lovely old building just outside the old town and it was charming and incredibly friendly. Our extremely comfortable double room cost just £48 per night. The restaurants in Riga serve just about every type of food you can think of, though quite a few specialise in Russian or Latvian food. On our first night we pushed the boat out and went to a place called Vincent’s and had a fantastic meal – not bad for £25 per head. The following night we went to a Russian place and ate our fill of stodgy but delicious grub, essential to soak up all the vodka they ply you with. Our second day was taken up with a visit to the central market which sells all manner of things, many of them a bit dodgy, so I stocked up on suspiciously cheap Marlboros. The covered area of the market is built from a recycled hangar that used to house Zeppelin airships, not something you see in Sutton Coldfield. In the afternoon we did probably the most terrifying and exhilarating thing I’ve ever done in my life, went on a genuine bobsleigh ride. We were the two passengers in between a professional driver and brakeman. I doubt that they go at full speed but you still hit 80mph and it is a huge adrenaline rush – not for the faint hearted! 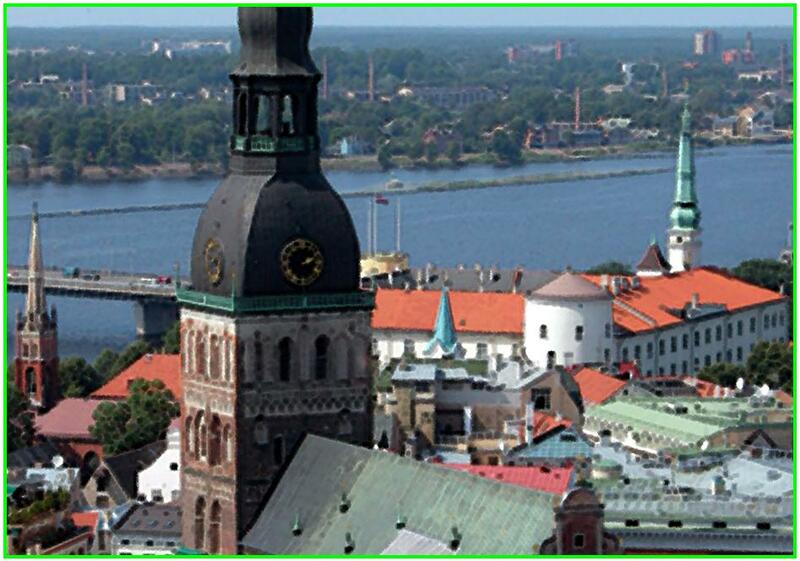 Riga is a great place for Sutton Coldfield residents to go for a short city break; just try to avoid the tourist bars and, if you go in the winter, make sure you wrap up warm!